Founded in 1948 in Unna, Germany, WIMA has long traditions in the production field of passive electronic components. Within a few years the company became one of the leading manufacturers of capacitors worldwide. 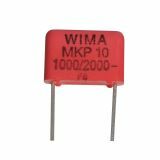 WIMA is specialized in the manufacturing of high quality film capacitors, paper capacitors and DC-Link powerful capacitors. The main customers of the brand are the automotive sector, industrial and consumer electronics, as well as the lighting industry and popular brands such as BOSCH and SIEMENS are trusted to WIMA. To maintain its position as a leading European and German company, and successfully meet the challenges of the global market, WIMA has invested in the most modern production conditions, the highest degree of rationalization based on maximum automation and highly skilled workers as to offer a reliability and highest possible quality or the well-known concept- "Made in Germany". In this context, WIMA has pioneered over the past decades. All WIMA factories are certified according to DIN EN ISO 9001: 2008 and to DIN EN ISO 14001: 2004, and the whole range of the brand is produced in accordance with IEC specifications. Furthermore, WIMA has priority in the use of recyclable materials and aims for a reduction of packaging materials. 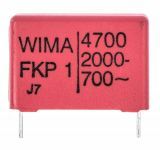 Continuing technical progress and expansion have made WIMA the first address for high quality film capacitors in the world. VIKIWAT Ltd. offers a variety of WIMA's product range. In our store, you can find various capacitors with affordable prices and fast delivery. Polypropylene capacitor, 4.7nF, ± 5%, THT Polypropylene capacitor with capacitance 4.7 nF, operating volatge 700 VAC, 2000 VDC and tolerance ±5%. Polypropylene Capacitor 1.12nF, 1.5kV, FKP-1, +/-5% Capacitor, polypropylene, with operating voltage 1500 V, capacitance 2.12 nF and case dimensions 26 x 5 x 13 mm. Polypropylene Capacitor 1.5nF, 2kV, +/-10% Capacitor polypropylene with capacitance 1.5 nF, operating voltage 2 kV, terminal pitch 15 mm, and case dimensions 18 x 5 x 10 mm. Polyester Capacitor 4.7nF, 1500VDC, 400VAC, +/-20% Polyester capacitor MKT type with operating voltage 1500 VDC or 400 VAC, capacitance 4.7 nF and case dimensions 5 x 11 x 18 mm. Low ESR and extended life. List Price 0.70лв. VAT Incl. 0.63лв. VAT Incl. 0.60лв. VAT Incl. 0.56лв. VAT Incl. 0.53лв. VAT Incl. Polypropylene Capacitor 4.7nF, 1.6kV, +/-5% Capacitor, polypropylene, with operating voltage 1.6 kV, capacitance 4.7 nF and case dimensions 7 x 16.5 x 26.5 mm. List Price 1.20лв. VAT Incl. 1.15лв. VAT Incl. 1.08лв. VAT Incl. 1.01лв. VAT Incl. 0.96лв. VAT Incl. Polyester Capacitor 22nF, 250VDC, 160VAC, +/-5% Capacitor, polyester, with operating voltage 250 VDC or 160 VAC, capacitance 22 nF and case dimensions 2.5 x 6.5 x 7.2 mm. List Price 0.60лв. VAT Incl. 0.54лв. VAT Incl. 0.48лв. VAT Incl. Polyester Capacitor 220nF, 250V, +/-10% Capacitor, polyester, with operating voltage 250 V, capacitance 220 nF and case dimensions 26 x 8 x 16 mm, class X2. Polypropylene Capacitor 0.33uF, 160V, MKP-4, +/-5% Capacitor, polypropylene, with operating voltage 160 DCV, capacitance 0.33 uF and case dimensions 18 x 12 x 6 mm. Polypropylene Capacitor 1uF, 305VАC, MKX2AW41005I00KSSD, +/- 10% Capacitor with 1 uF capacity and 305 VAC. Polypropylene Capacitor 1nF, 2KVDC, +/-10% Capacitor, polypropylene, with operating voltage 2 kVDC, capacitance 1 nF and case dimensions 4 x 9 x 13 mm.